*This review was originally published at The Movie Mezzanine. There is a conundrum that film critics often face while writing about documentary cinema: although form and content are perhaps more easily separable in documentary films, they are also significantly easier to conflate in criticism. Meaning fiction films are regularly dismissed for unassuming presentation of content, but documentaries get a free pass if their subject matter is moving or important or fascinating as a separate entity from the film itself. Clichéd formal practices are often forgiven if the material piques our interest. 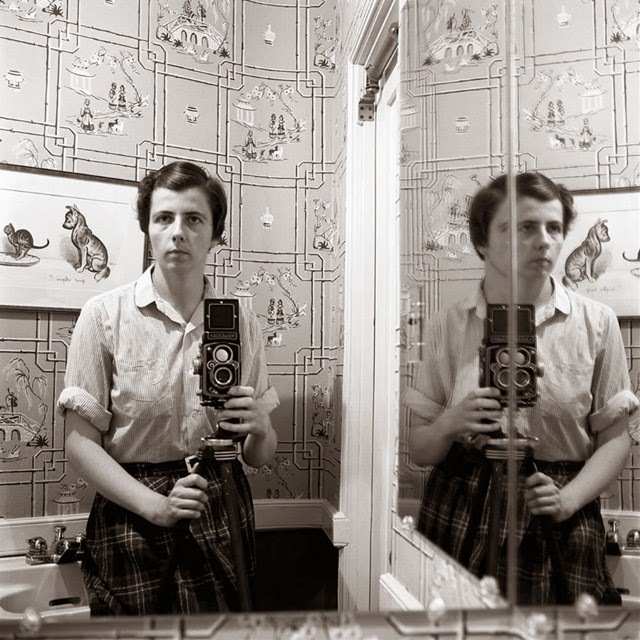 Finding Vivian Maier is the most recent case of a documentary film that coasts purely on the force of its enigmatic subject, rendering it in effect impossible to judge the film on any merit beyond the power of the mysterious woman it tries to solve. The titular artist, a New York-born woman of European heritage, spent nearly four decades of her life as a nanny in Chicago and New York. To the families she lives with, she was known for her obsessive interest in street photography and the enormous number of boxes she hid in her room. Yet, no one had ever had the opportunity to glance at any of these photographs. Vivian’s massive collection of boxes – in which she kept everything from pawnshop receipts to small earrings to newspapers, was rediscovered when John Maloof, a Chicago historian happened to buy one of them for an art project at an auction. When Maloof processed the negatives and scanned them on the internet, the public response was outstanding. The pictures were captivating portraits of Chicago and New York between the 1950s and 1970s. Maloof was tempted to dig deeper into Maier’s story. Several years later, he is still on a mission to get Vivian’s work recognized and exhibited at museums, but his film doesn’t stop there. Maloof traces Vivian’s life with diligence through the children she cared for over multiple decades all the way to the small village of Saint-Bonnet-en-Champsaur in France, where she spent some time with distant family. Of all the things Maloof – who co-directed the film with Charlie Siskel – can be criticized for, lack of energy isn’t one. He is relentless in his pursuit to unlock the key to Vivian’s mystery. He leaves no stone unturned. Hence, what is interesting about the film, an otherwise generically produced documentary at best, is what Maloof finds when he crosses over to the dark side of Vivian’s personality. The presentation of Maier’s work in the film leaves something to be desired and the audience can feel that an exhibit of her work – where the haunting, humane quality of the photographs speak for themselves without musical cues, unnecessary, incongruous cuts to inserts of nature and other tired documentary practices – can have a more immediate impact. Ultimately, the story of Maier’s life is so fascinating that it overcomes the film’s shortcomings. The interviews with the men and women who were in her care as children offer a new perspective that digs deeper than the surface of her artwork and engages the audience with the woman behind the camera. Maloof’s vibrancy and wide-eyed curiosity for Vivian’s work is incredibly affecting and pierces through the screen. Perhaps it also makes a case for Finding Vivian Maier’s lack of creativity: when the subject at hand is mesmerizing beyond measure, shouldn’t one forgive filmmakers who take a step back and avoid imposing their personal style?